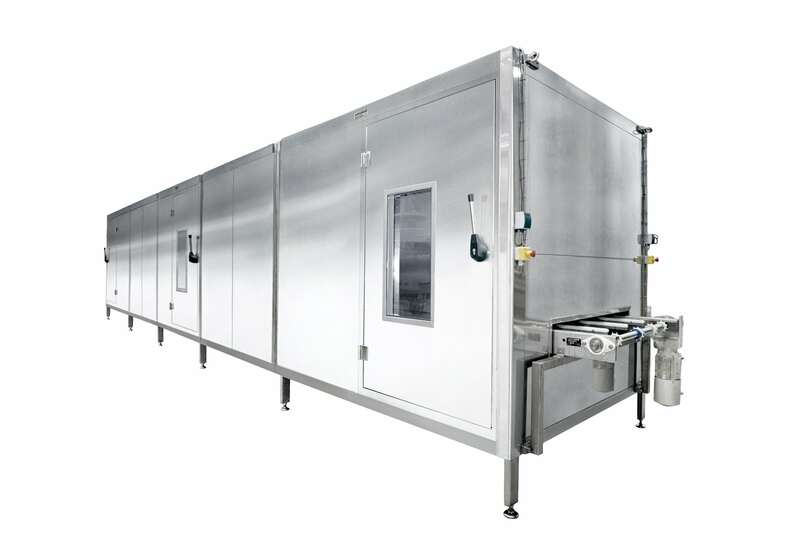 Extrufood manufactures various (single and multiple deck/tier) cooling tunnels that cool and condition the extruded product to room temperature in the most efficient manner. With continuous extrusion production lines, it is very important that the product is conditioned to room temperature so that cutting and packing can be part of the continuous production process. The multi-tier cooling tunnels are fitted with a retractable infeed belt which allows the cooling tunnel to be used as a single tier cooling tunnel as well. This feature also allows products with a high filling ratio of 30/70 (30% outside and 70% filling) to be produced on the same line without having to make drastic changes to the line set-up. The infeed belt on the Extrufood cooling tunnel can simply be moved up or down. All Extrufood cooling tunnels are tailor made to customer specifications.